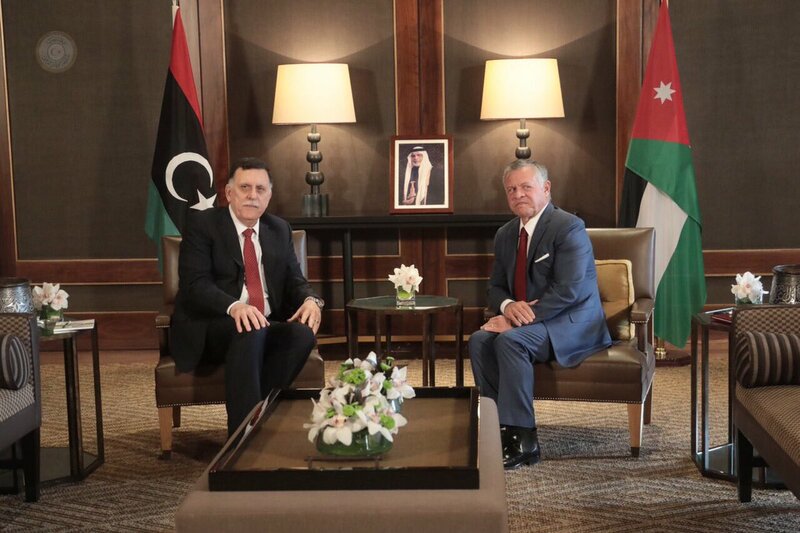 King Abdullah II of Jordan received Saturday the Head of the Libyan Presidential Council (PC) Fayez Al-Sirraj in Amman. Al-Sirraj and King Abdullah both agreed to reactivate agreements of joint cooperation between the two countries in fields of economy, security, health and educations, according to the media office of the PC. The discussions between Al-Sirraj and King Abdullah went over many issues of mutual interest for the two countries. The discussions were also excepted to cover the payment of medical debts by Libya to the Jordanian hospitals where many Libyan injured fighters and patients had been treated. Libya vowed earlier to pay 125 million dollars in debt to private hospitals in Jordan starting next month. Jordan owes Libya 250 million dollars in total. Meanwhile, media sources expected that Al-Sirraj would meet Khalifa Haftar in Jordan after international pressure on the latter to allow the military institution in Libya be under the umbrella of a civilian ruling. This comes as Al-Siraj and Haftar had shown some signs of concord after Palermo Conference in last November.